Absolutely beautiful!!! It looks so nice on my new bed, I highly recommend this comforter set very warm and classy looking! Invigorate your space with the striking modern look of the Madison Park Crawford 7 Piece Jacquard Comforter Set. The black jacquard woven comforter flaunts a sequin design that adds a stunning contemporary accent to the top of the bed, while a solid grey reverse provides a rich touch of color. Matching shams echo the look of the comforter, spreading the dazzling allure to the head of the bed. 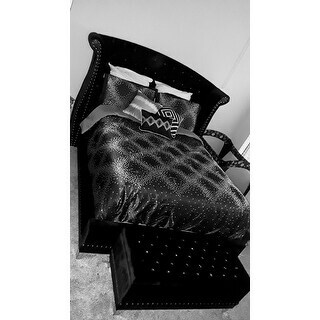 Three decorative pillows with embroidered details and a solid black bed skirt complete the bedding set by providing the perfect finishing touches. Machine washable, this jacquard comforter set brings a bit of glitz and glam to update your bedroom decor. This is an EXCELLENT bedding set! It has a sheen feel to it so it does not collect or attract lint of pet fur. The slight sheet to the look is more matte than true shiny so it is a very elegant set and has weight to the comforter like any fine fabric bedding set would. The comforter itself is quite well made and I was pleased with the quality. I am used to purchasing comforter sets like the Croscill brand sets that cost much more so I was very pleasantly surprised upon examining the fabric and finishing of this set. I bought the black, but but I am sure the blue and grey colors offered would be just as well made and elegant in any room. The design makes it appear that the set displays a scattered sequin effect. In reality it is a print so it only looks like sewn on sequins scattered on the shams and comforter- which is MUCH better than actual sequins as you do not have to worry about losing any in the washing. I would think this set is classy and elegant enough to be used by either a man or woman for their bedroom. It could be paired with just about any style of furniture and would not seem overly feminine for a male. It is just a well- made, classy comforter set that will certainly get compliments in any room you put it in. My queen set came with two shams, the comforter, three accent throw pillows, and a solid black bed skirt. I am extremely happy with the look and quality and would highly recommend this set! I really like this purchase. I was a little concerned that the silver pattern would be too much, but It’s not too flashy. It is perfect. The quality is excellent and looks great in my room. I bought a king size for my queen size bed, because I wanted the extra width. It works perfectly on my high bed. I used the black queen size dust ruffle I already had and it’s perfect. The accent pillows are modern and set the comforter off. I have got many compliments on my comforter set. I give it 5 stars for great quality and appearance. Both my husband and I really liked the pattern on this set. It looks even better in person. We had originally purchased the duvet set from another store, but the cover didn't fit, so we returned it. We were happy to find the 7 piece comforter set for a great price on Overstock. We have a king bed and wish the comforter were a little wider, but the measurements are stated in the description, and it looks fine with black sheets and the black bed skirt. I absolutely love this comforter set! It goes beautifully in our bedroom which has a lot of black furniture and ties the space together as well as provides the warmth and comfort we wanted. Beautiful bedding set. You can never go wrong with Madison Park bedding. I use this in my master bedroom. It goes perfect with the grey shag rug I have in there. I absolutely love this comforter set. It looks so much better in person, and the material on the other side of the comforter is very soft and cozy. So happy with my purchase! This comforter set I even nicer in person! The attention to detail/pattern is really high quality and the comforter is very warm. Highly recommend! Beautiful Comforter. Its very soft and warm. I have it in blue and black. Great price too!! The comforter is beautiful great quality . I love it , it look beautiful in my bed ! I highly commend if you like it to buy it . BEAUTIFUL !!!! Beautiful comforter for my master bedroom! I remodeled my bedroom and this comforter perfectly matched my light gray walls with black and gray carpet. This made everything come together beautifully. Spent weeks looking for the perfect bed setting, when i stumbled across this one. I fell in love with the pictures and it’s even better in person, it matches bedroom perfectly. "Is the sequins on the comforter is it sewn on top or part of the fabric?"